We feature odorless chemicals for most pests. Ladder equiped for wasps, bees & yellow jackets. 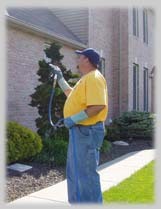 Power spray for bees, ants, & flys.